In 1851 vast amounts of ironstone were discovered in Northamptonshire and the London & North Western Railway (L&NWR) decided to capitalize on this occurrence by proposing a new railway line between Northampton and Market Harborough. This in itself would open up more of the countryside for railway travel by providing a link between the lines from Rugby to Stamford, and Blisworth to Peterborough. Pitsford and Brampton station when open. Designed and built by George R Stevenson, the Northampton to Market Harborough line was opened in 1859. 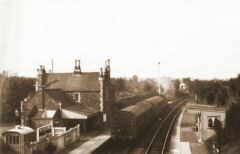 It had six stations: Northampton, Pitsford and Brampton, Spratton, Brixworth, Lamport, and Market Harborough; and two tunnels; Kelmarsh which was 322 yards long and Oxendon — 462 yards long on the down line (to Northampton) and the other 453 yards long on the up line (to Market Harborough). The line had a staggered history, particularly in its final years. It was first closed to passenger traffic on 4th January 1960 but was reopened to through traffic on the 6th January 1969. It was closed again on 1st May 1969 and reopened on 10th July 1972. The passenger service was finally withdrawn on 26th August 1973. In June of 1981 a group was set up, calling itself the Welland Valley Railway Revival Group, to reopen as much of the line as was possible. On 15th August 1981 the group organised a special train to run from Northampton to Market Harborough and back. 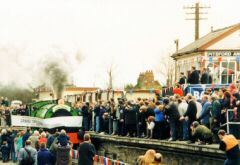 People gathered at the old station sites, bridges and crossings to see the last British Rail train on the line that had given 123 years of service. The next day British Rail closed the line to all traffic. The Northampton Steam Railway soon emerged and three years later the group had changed its name to the Northampton & Lamport Railway (NLR for short), and had started to rebuild the railway in the old goods yard at Pitsford and Brampton station. This is now the railway's headquarters and is situated approximately 5 miles north of Northampton. Grand Opening of the Railway. Northamptonshire County Council purchased the line, and converted it into a linear country park and cycle way from just outside Northampton to just outside Market Harborough. Northampton & Lamport Railway has leased the track bed from the County Council. There is a safety fence separating the track from the footpath. Phase one of its works is now complete, consisting of a station, two signal boxes, ¾ of a mile of running line, and sidings. The first passengers were carried along the reopened section on 19th November 1995 and the line was officially reopened on the 31st March 1996. The final part of phase one, the extension of the line from Bridge 13 to Bridge 14, was achieved by fundraising and seven years of hard work from our volunteer members and at a cost of �50,000. In 2002, the first passenger train crossed the restored Bridge 13 since its closure by British Railways in 1981. The next phase is a ½ mile (approx) extension of the line south to Boughton Crossing and ¼ mile (approx) extension of the line north to Merry Tom Lane. The southern extension has become the focal point for this year. Planning permission has been received, the lineside has been cleared and track laying is continuing towards Boughton Crossing where a run round loop and station will be built.